On the roof of the building is a somewhat precarious, modest but pleasant hall, with salmon-colored walls that reflect the light coming in through the large windows that also allow some fresh air to provide relief from the heat of this February that seems to be August. We are welcomed by the company’s director Ana Rosa Meses. Ana Rosa is a young, lovely woman with a body that has been shaped by a dancer’s training and at the same time reveals sensuous Cuban curves. She explains that to dance flamenco well, dancers do not necessarily have to have the extremely slim silhouettes they need for other dance styles. Quite the opposite; you need a bit more substance to create an attitude in the tablao and imbue the movements with all the character they demand. As she speaks, the passion she feels for her work is obvious and, as another dancer in the company later tells us, this is more than an art form, it is a way of life. One by one, the company’s troupe filters in; first the dancers and then the musicians. 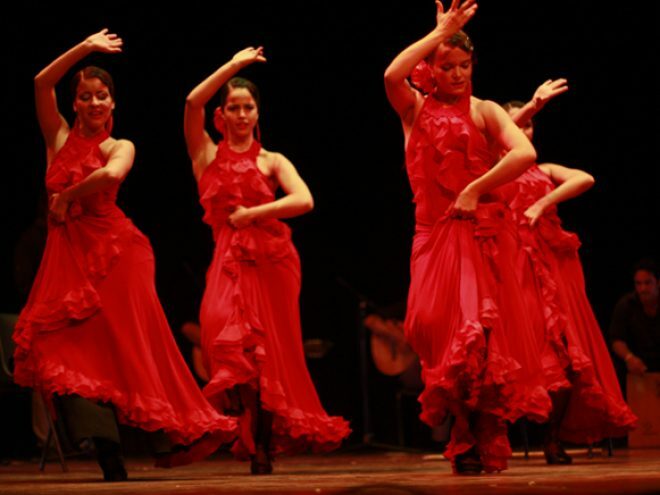 There is the more traditional style, coming to us from the gypsy gatherings of Andalucia, more suited for the taverns and tablaos that abound in Cuba; and then there is the more stylized version, where the rumba flamenca appears to have African overtones and a guaguanco is danced that electrifies us with its expressive power. The accompanying music is live. Of course the strumming guitars and the voices of the cantaores are there and even though in Cuba no real specialized training for this art form exists, the artists know the traditional lyrics and adopt manners of singing that are reminiscent of the inflections and pronunciations of Spain. They also sing flamenco-tinged boleros and Cuban songs. And over there beside the caja, are two tumbadoras and a bongo. Although most of the young dancers are students of National Arts School classes there are also a few whose only training over the years has been provided by Ana Rosa. They teach classes for girls who love flamenco with a passion. “Because this is something you have to love”. They then explain that everything begins with the music because that is what contributes the rhythm and the feeling. The heels of their shoes become instruments and add to the acoustics, creating true “echoes” deep within their audiences. We are invited to one of their gatherings where, in an intimate setting, they sing and dance. We are told that that is where the most delightful improvisations are born, the ones that don’t make it to the stage because the pressures of the audiences tend to dampen them. “These are beautiful moments, but they are terribly ephemeral”. We are also told about their regular shows at El Mesón de la Flota in Habana Vieja which turns into a flamenco tablao every night from Friday to Monday. They satisfy everyone’s taste in flamenco: pure flamenco and the Cuban hybrid. They tell us about their performances around the world, success in the United Arab Emirates, their recently won Villanueva Critics’ Prize that seems to be their birthday gift, their long and fruitful alliance with the famous Spanish dancer Cristina Hoyos and other well-known bailaores and cantaores who come to Cuba to give classes. “We go to the Malecon, we sing and dance at parties, like they do in Andalucia and we learn more there than we do in any classroom”. Passion and flamenco: that’s it. No more, no less. I depart with my soul filled with music, my spirit affected by the sadness of the cantos and my feet wanting to strike out rhythms with my heels.